Hollywood Bowl is the UK’s largest operator of tenpin bowling centres. It currently has 58 centres across the UK with 43 trading under the Hollywood Bowl brand, 4 as Bowlplex and 11 as AMF. In total, these centres have 1,390 bowling lanes. The average size of each centre is around 30,000 square feet with 24 bowling lanes. The company rents all its properties on long-term rental agreements. 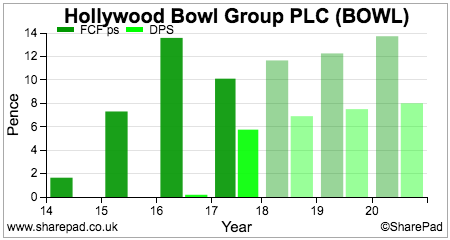 Sales are fairly stable across the year with peaks coinciding with the timing of school holidays. Wet weather tends to help increase sales with hot weather doing the opposite. The company is not pursuing an aggressive growth strategy by trying to open up lots of new bowling centres. It is very much focused on improving the performance of its existing centres and is taking a cautious approach to expansion. This can be best summed up as a quality over quantity approach. Around 60% of the company’s centres have been refurbished. By refurbishing them, it is looking to make them more family friendly so that people stay longer and spend more money. The company is upgrading its bar and dining facilities, replacing carpets, adding new lighting and introducing new VIP bowling lanes to enhance the customer experience. The refurbishments seem to be having a very positive impact on the company’s performance. This has also been helped by the fact that the UK bowling market has been growing for the last four years. According to the company, the money spent on refurbishment is earning very attractive returns – averaging 33%. I have not seen a definition of these returns but my guess is that it is referring to the profit uplift from the refurbishment as a percentage of the money spent refurbishing the centre. This should not be interpreted as the bowling centres as a whole making returns on investment of 33%. More on this shortly. Further evidence of the effectiveness of the refurbishment is shown in the table above. More games are being played with customers spending more per game. This has seen Hollywood Bowl produce a very impressive and sustained performance of like-for-like sales growth. This growth rate slowed in 2017 but is still a good performance given the tough comparatives it was up against. The company has a very sensible approach to opening new sites. 70% of its existing sites are located next to the top cinema in towns and cities, on retail parks, or in shopping centres where footfall is high. It has a very good relationship with landlords such as Intu Properties (LSE:INTU) who are looking to mitigate a tough retailing environment by expanding the amount of leisure space in shopping centres. The company currently has agreements for four new bowling centres over the next couple of years and is looking to open up two a year. The UK bowling market has become increasingly polarised in recent years with growth being driven by the bigger operators such as Hollywood and Tenpin. Many independents have closed and poor locations have struggled to make money. Given this backdrop, Hollywood Bowl’s cautious expansion plans look sensible and realistic. If it can find good-sized properties in attractive sites then it should be able to make good returns for investors in my opinion. So far, this strategy has served it well. It has no loss-making sites and the average profit per site has been growing nicely. Average EBITDA per site was £786,000 in 2017. Bowling is a highly profitable activity for Hollywood Bowl. The directors consider it to have a gross margin of 100% due to the absence of direct selling costs (surely there is some direct labour cost?). Overall gross margins are very high at around 86% and have been helped by a new drinks contract and better terms on amusement machines. Trading profit margins (EBIT) have also seen a nice improvement in recent years. This has been helped by improved gross margins, refurbishments and some operational gearing as the bowling centres have quite a high level of fixed costs (rents, depreciation, utilities, staff). The rent bill for the company is currently £13-14m which implies nearly £100m of off-balance sheet property assets and hidden debts if these are capitalised at a factor of seven times. Taking these into account, returns on capital employed (ROCE) have been improving as profits and margins have increased. ROCE in 2017 was a respectable 13.6%. One of the measures I am increasingly looking at with companies is the cash return on cash capital invested or CROCCI for short. This looks at adjusted EBITDA as a percentage of cash capital invested. Hollywood’s Bowl’s calculation of adjusted EBITDA looks pretty reasonable to me. Exceptional items in the past seem to be genuine one-offs whilst I am pleased to see that it treats share-based payments as a real expense unlike so many companies these days. If I add back accumulated depreciation and amortisation to capital employed I can get an estimate of cash capital employed. 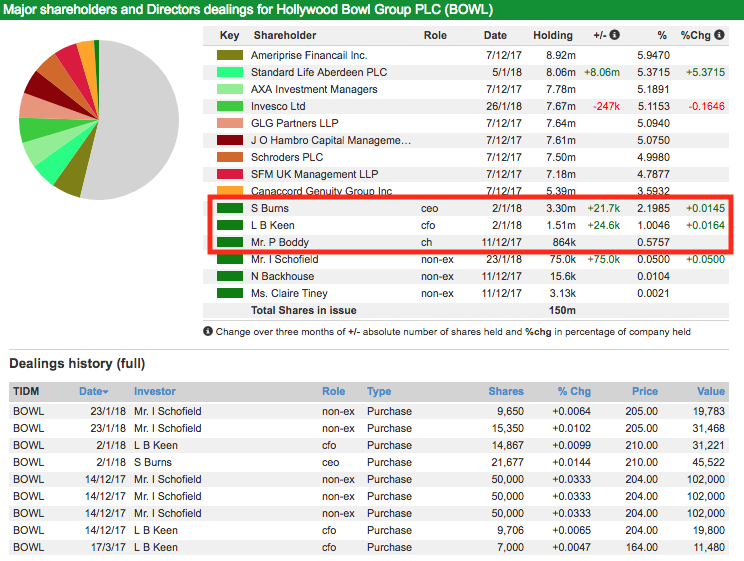 On that basis, Hollywood Bowl was making a CROCCI of 18.6% in 2017. 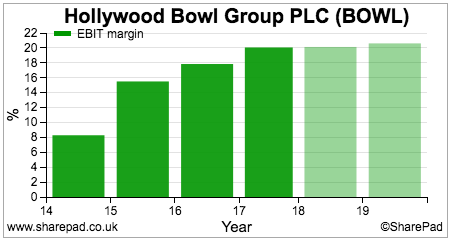 That is a very decent number and compares very favourably with other leisure companies such as pubs (c8-12%). Using capex and adjusted EBITDA forecasts from SharePad I can also estimate what might happen to CROCCI over the next 2-3 years. 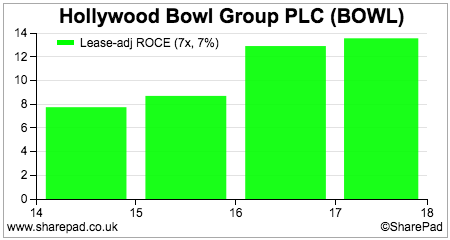 I add forecast capex to the previous year’s capital employed to get an estimate of cash capital employed. Bear in mind that this estimate will not be perfect as it will ignore changes in working capital or any acquisitions and asset disposals, but it will not be too far off. Based on my estimates, Hollywood Bowl’s CROCCI is expected to remain at a very decent level. A few weeks ago I wrote about how you could track a company’s incremental financial performance over a number of years (click here). As you can see, over the last four years, the incremental profit margins, ROCE, CROCCI and free cash flow margins have been very good. Although properties are rented, the bowling centres do have a reasonable amount of assets in them in the form of fixtures and fittings. We have seen from the CROCCI calculations above that the returns on those assets are pretty good. However, if you really want to give the tyres of a business a good kicking then checking out the condition of its assets can be a very worthwhile thing to do. 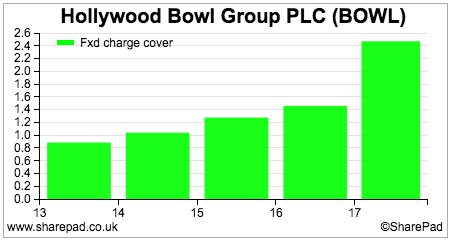 The estimated useful life of the assets – one divided by the depreciation rate. This does assume zero or residual/scrap value for the asset which may or may not be realistic. 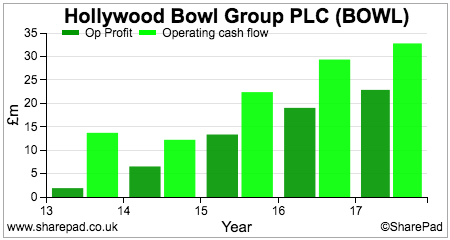 The estimated age of the assets – accumulated depreciation divided by annual depreciation expense. How worn out the assets might be – net book value (NBV) as percentage of original cost. The table above looks at plant and machinery and fixtures and fittings. We can see that estimated lives have increased and that the assets are getting older. In general, the company expects its fixtures and fittings to last on average 8 years. On this basis I’d say that its depreciation expense and asset condition is reasonable. It is worth noting that in 2015 the company increased the estimated useful lives of its bowling alleys from 8 to 40 years. This boosted profits in that year but had no effect on cash flows. It also looks to be a similar depreciation policy to other bowling operators such as Tenpin and MFA Bowl. Hollywood Bowl has been good at converting its operating profits into operating cash flow. 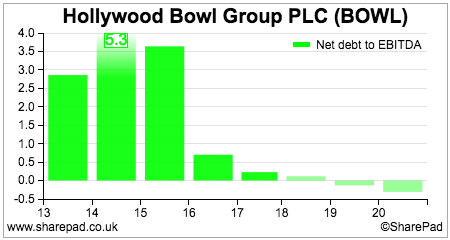 It has also been good at converting its earnings per share (EPS) into free cash flow per share. This is a sign that profit quality is good. Debt has been coming down rapidly as evidenced by a very low net debt to EBITDA ratio. Paying the rent bill is not a problem either with fixed charge cover at a very comfortable level. The company also has plenty of cash left over to pay its dividend. It also paid a special dividend in 2017. Given the levels of free cash flow and a target net debt to EBITDA ratio of 1.0 times then it looks as if more special dividends are likely in the years ahead. It’s always good to see the chief executive, finance director and chairman owning lots of shares in a company. It never fails to surprise me that there are still plenty of companies out there with directors telling investors how good their company is but not owning a meaningful amount of shares themselves. This criticism cannot be made of the directors of Hollywood Bowl. All three main directors own lots of shares. The finance director has been a meaningful buyer in recent months. Executive pay is not excessive either. The CEO is taking home a little over £250,000 with the finance director a little over £170,000. Annual bonuses are capped at 100% of salary. There is a slug of free shares available to the CEO and FD if the company hits its financial targets in 2020 which it looks as if it will. Analysts are currently expecting steady growth from the company over the next few years. A net cash position is also expected by 2019. 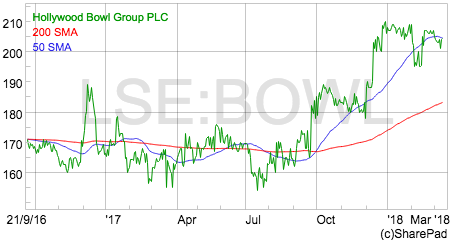 At 200p, the shares trade on a one year forecast rolling PE of 15.6x which looks reasonably attractive given the quality of the business. The forecast dividend yield is 3.5% but this excludes any special dividends that might be paid out. I very much like a lot of what I see with this company but do have a couple of reservations. I do wonder how resilient the business will be in a recession if families start tightening their belts. 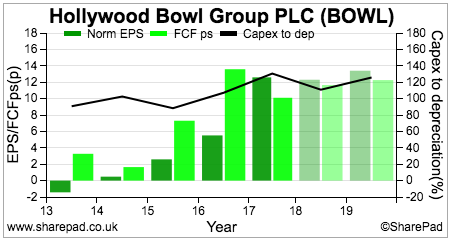 That said, the cost per game is hardly expensive and compares well with competing activities such as going to the cinema. The other issue is what happens when the refurbishments to existing bowling centres have finished? To me, this has been a key driver of LFL sales growth and profit improvements. Once the uplifts have been realised then opening two new centres a year is probably not going to deliver huge amounts of growth. In many ways this doesn’t really matter as the share price is hardly pricing in rapid profits growth. If profits can hold up and grow modestly then an investor may be able to buy themselves a slice of a decent, steady cash-generative business at the current share price.